Depending on who’s calculating, we either got too late of a start, or we started at the perfect time. Sam and I are typically in agreement that being up high as the sun sets is worth descending in the dark. The Going-to-the-Sun road in Glacier National Park is iconic for its spectacular scenery, epic climbs through a steep landscape, and spring bike riding. 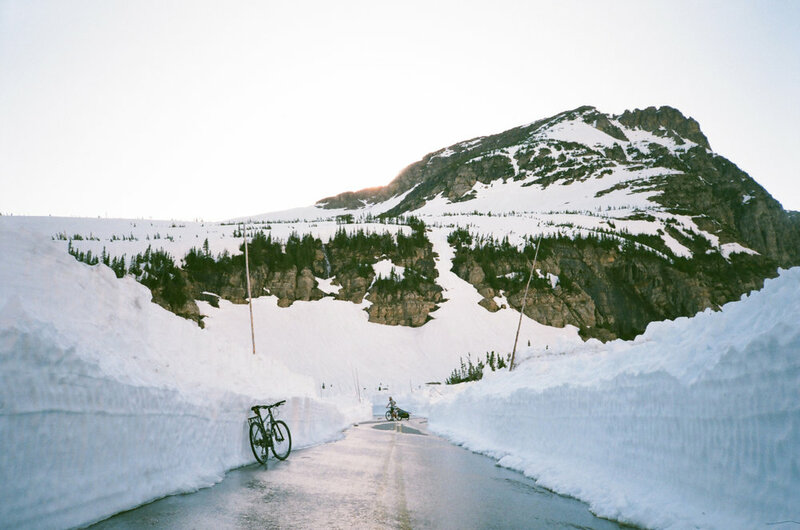 Before the road is open to visitors in the late spring/early summer, cyclists flock to the park to ride undisturbed through the melting snowfields in the mountains. Sam and I had a more unique mission: we would ride our bikes the ~18 miles and 3000+ feet up to Logan Pass with skis in tow, and explore around the surrounding peaks on our skis. Lucky for me, Sam was willing to tow our ski gear the whole way. We didn’t start riding until after 3pm, and lots of cyclists were returning to their cars. We may have received a look or two of concern, but June days in Montana are long, and we came prepared for a late descent. It was a perfect day on the Going-to-the-Sun road. Our late departure ensured we had the place mostly to ourselves, and even at 5pm, the sun shone down on us and the park rewarded our efforts with spectacular scenery. Amid walls of snow and ice, we reached Logan Pass shortly before 8pm, with just enough time to change gears and change gear before the sun started to set. It was my first time at Logan Pass, and I was in awe of the surrounding mountains. 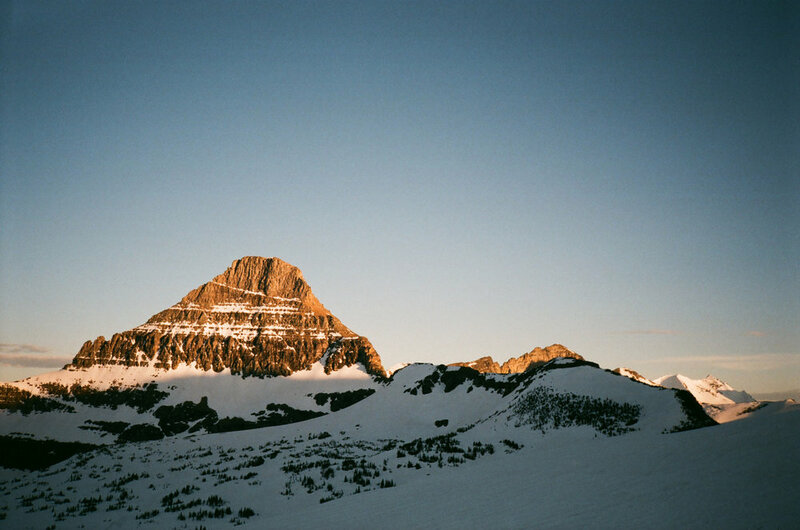 The ranges in Glacier are dramatic. They’re steep, colorful, and rich with texture. To be among these giants in golden hour gave me my favorite feeling of backcountry heart-thumping goodness, a feeling that swells in my chest and makes me feel as though I could fly. The snow remained soft as the sun disappeared behind the surrounding peaks, and we descended into a pink expanse, hearts flaming. Is there any better feeling than skiing corn under a setting sun? The ride down under a waning gibbous stung our eyes and cheeks, the cold night air whooshing by as we rode beneath the stars. I would have loved to stop for more photos, but before long, I discovered a slow leak in my rear tire that had me bolting for the finish line. Of course, the road was gated so there would be no driving up to retrieve a bike that couldn’t make it to the bottom. With high beams blazing and jackets zipped tight, we rode as fast as we could into the night, and made it back to the van in time for a beer and a quick jaunt with the dogs, before searching for a quiet spot to sleep alongside a glacial creek in Montana’s wilderness.